They're not feeding you on the plane, so might as well tuck in before hand. 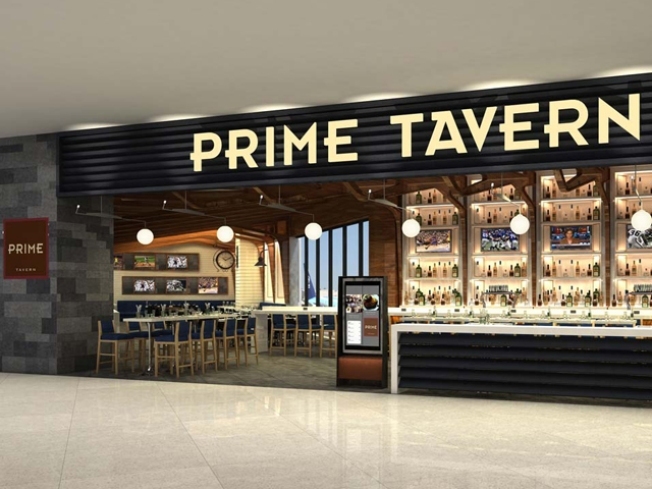 This artist rendering provided by ICRAVE shows the Prime Tavern, scheduled to open in the Delta Air Lines terminal at LaGuardia Airport, Saturday, Aug. 21, 2010. With travelers waiting longer due to more extensive security checks and flight delays, airports across the country are swapping out fast food joints for sit-down restaurants. Forget about greasy french fries, soggy pizza or that sandwich that's been sitting out for hours. Filet mignon, crispy duck confit and crab cakes are taking off at the airport. Delta Air Lines is putting 13 new restaurants, bars and cafes in its LaGuardia Airport terminal by next summer, opening the first four Saturday morning. With travelers waiting longer because of more extensive security checks and flight delays, airports across the country are swapping out fast-food joints for sit-down restaurants. It's part of a trend of airlines serving their customers before they board their flights, said air industry expert Terry Trippler, owner of rulestoknow.com, a website dedicated to airline rules. "The more conveniences that are available before they board the aircraft, the happier they're going to be when they board the aircraft," Trippler said of airline passengers. "And you can make some money with a nice restaurant, too." Delta's senior vice president for New York, Gail Grimmett, said that the Atlanta-based airline is proud of its on-board service but that customers want their experiences in the airport to be "as smooth as what they experience in the air." "People are looking for things in the airport other than a fast-food environment," Grimmett said. Airports across the country have already made the switch to classier food options for passengers. There's a wine bar at Philadelphia International Airport, a seafood restaurant at San Francisco International Airport, an Asian bistro in Tucson International Airport. Ike's, a local favorite in Minnesota, offers sit-down service at Minneapolis-St. Paul International Airport. Delta's remake of the LaGuardia terminal will be similar to what JetBlue Airways Corp. did at Kennedy International Airport in 2008, but it will have some extra food options. Delta hired the company that redid JetBlue's JFK terminal, OTG Management, to pick chefs to create menus and train kitchen staffs at LaGuardia. Delta Air Lines Inc. wouldn't say what it costs to open its restaurants at LaGuardia. The airline will get a portion of restaurant revenues, Grimmett said, but she didn't say how much. The first thing passengers will see when they pass through Delta's LaGuardia terminal is Prime Tavern, a steakhouse by Michael Lomonaco, executive chef of the Porter House in Manhattan and formerly of the World Trade Center's Windows on the World. The lack of food options at LaGuardia, one of the nation's busiest airports, disappointed travelers, Lomonaco said. "The terminal really needed some new restaurant concepts," he said. "It was long overdue for an overhaul." Restaurant standards such as chopped salad, chicken wings and hamburgers are available, but now so are creamed spinach, jumbo shrimp cocktail and New York strip steak, for about the same prices as on the Porter House menu. As passengers walk down the corridor to their gates, a French bistro offers roasted beets, lobster court bouillon and creme brulee. One of the bistro's chefs, Lee Hanson, said a smaller version of the bistro exists at JetBlue's JFK terminal and is popular there. "There's nothing fancy about it," Hanson said. "It'll just be a little more variety for people." Michael Coury, the concept chef for OTG Management who recruited the chefs at JFK and LaGuardia, said he's trying to break the mold of "horrible" food in airports. "The whole point of travel is that you're looking forward to going somewhere," Coury said. "Why can't that start as soon as you get to the airport because you're going to have great food and wine and beer?" Consumer expert Joe Brancatelli, a columnist for the business travelers' website joesentme.com, said the changes are part of an effort to make dining at LaGuardia similar to dining in New York City. "What you want is a sense that your airport terminal is indistinguishable from your midtown (Manhattan)," Brancatelli said. Though Brancatelli likes the new food offerings, he said it's just another way for airlines, airports and vendors to make more money. "You can't charge someone $20 for a doughnut, but you can for a steak," he said. Lomonaco's steaks will cost more than $40.